The mechanism usually adopted for the protection of end-to-end data on the Internet is based on the use of Transport Layer Security (TLS) and its predecessor, Secure Sockets Layer (SSL), both of which are cryptographic protocols that allow communication safer and integrity of data over TCP/IP, encrypt the communication from the source to the destination transport layer. A typical TLS/SSL (for example via internet browser) provides an authentication type called unilateral: only the server is authenticated (the client knows the identity of the server), but not vice versa (the client remains anonymous and authenticated). The client (Web browser, EmailUI, Java Client, etc …) validates the server certificate by checking the digital signature of server certificates, verifying that it is valid and recognized by a known Certificate Authority using a public key encryption. Figure 1 illustrates the case where the browser establishes a connection to a website (or web application) that exposes a certificate from a Certificate Authority not recognized. 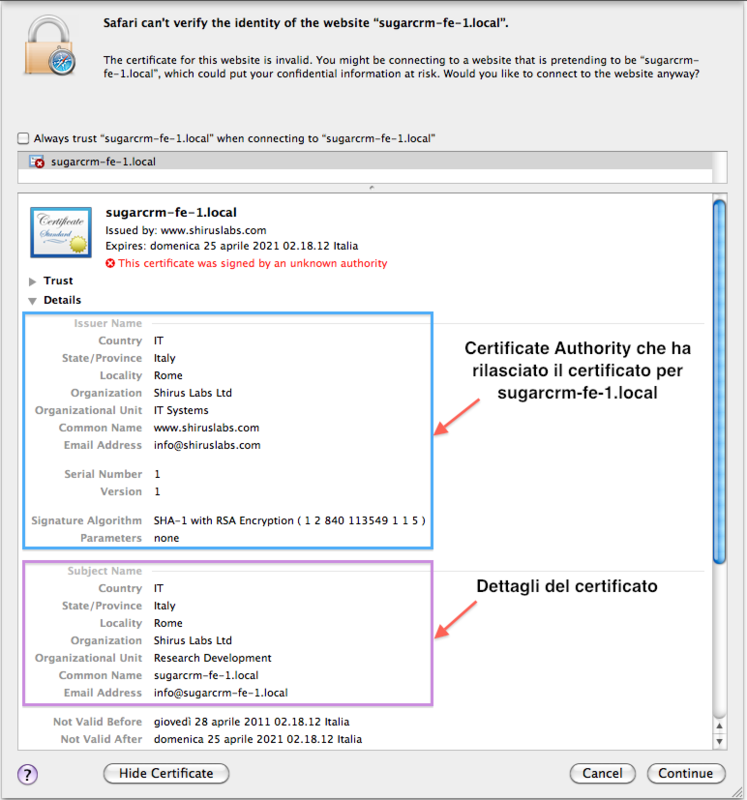 The user can take certain actions, whether to continue or abandon the connection, it is also possible for the user, consider instructing your browser to trust the certificate. Figure 2 shows the details are on the chain of certification (Certificate Chain). The browser (in this case Safari) has all the reasons to issue a warning, in effect, the Certificate Authority (CA) has indicated a pure invention. If you’d like to make TLS/SSL connections using software written in Java (as a client), you must ensure that all Certificate Chain (or certificate chain) is satisfied or at least should have to trust the certificate . The Java platform uses a system called Java Keystore for the management of security or rather, storage and administration of all that revolves around digital certificates (Public/Private Key, Root CA, CSR, etc …). The default implementation is based on the Java Keystore file, it is a proprietary format called JKS. For those wishing to know more about security in Java, I recommend reading JDK Security-related APIs & Developer Guides which will show you all the new features and improvements of JDK 8. Client side: Java keystore containing the certificates that are used only by applications that act as a client. The name usually given to this repository and trustStore. The default location of both the keystore is <java-home>/lib/security/. For simplicity, during the course of the article I will refer generically to keystore name. The classic mistake that we encounter when the Certificate Chain is not met, is an exception of the type shown below. 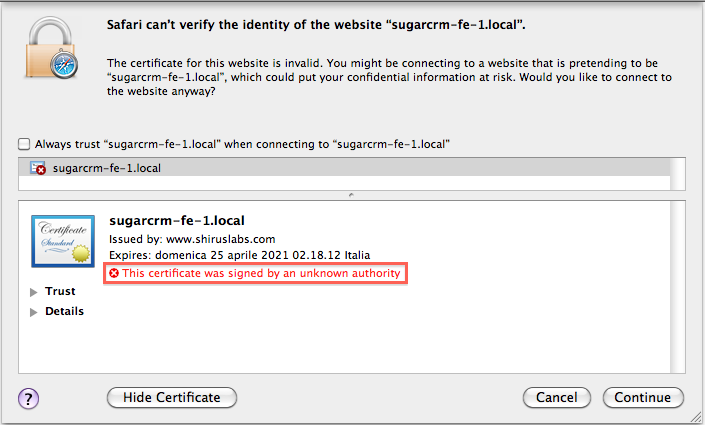 The exception is triggered because it was not found a valid Certification Path to the SSL connection request executed. Importing the server certificate on the Java Keystore. Export the server certificate can be accomplished in several ways, perhaps the easiest way is through a common browser (Firefox, Internet Explore, Safari, etc …). Publishing the post that explains how to do this with Mozilla Firefox: Exporting to File Server Certificate in Firefox 3. Similarly, you can proceed to export the server certificate using the most common browser. The method that I prefer to export the server certificate in DER format is to use the openssl tool (see command below). Once you have the server certificate, you must import it on the Java Keystore using the appropriate tool named keytool (keytool-Key and Certificate Management Tool). I remember that the keystore is the container of digital certificates. The scenario proposed here is based, custom keystore to a file, created from importing the server certificate, we leave intact the system keystore. As the Java application acts as a client, you must specify the location of the keystore (remember to be kind trustStore) through the property java.net.ssl.trustStore. Through a practical example and I would also realistic enough, we saw how simple and immediate import digital certificates in the Java Keystore, so that applications work correctly. I think this is my third article created to respond to questions or problems raised by my colleagues!